Rice Epicurean has a storied history. It’s a bit of a strange contender for this website. While technically not being completely gone, the single store that exists today is a far cry from the chain that once existed. The original store, which opened on May 5, 1937, was located on Rice Boulevard hence the original name of “Rice Boulevard Food Market”. The store was one of only two establishments in the now popular Rice Village Shopping Center. In April of 1957 a second location was opened in the Tanglewood area at 5016 San Felipe. The fact that this new location was so far from the Rice area necessitated a change in name to “Rice Food Markets”. By 1960 Rice had added another location bringing their total up to 3. The same year a merger took place with another grocery chain owned by a local family known as “Jack’s”. This brought the total store count up to 6. The chain had a brief stint on the public market from 1968 through the late 70s. Which ended when the original founding family reclaimed control of the store. In the 1980s Rice hit its peak number of stores at 55. To help fit the turbulent local grocery market of the time, the chain converted some of their stores into discount grocery retailers “Grocery World” and “PriceBuster”. In 1984 Rice took control of 5 Weingarten’s Grocery stores, after the Weingarten family decided to exit the grocery market and deal in real estate instead. In 1985 Rice purchased multiple Eagle Supermarket locations in Houston. The parent company of Eagle, Lucky Stores had closed their stores in Houston approximately one month before Rice’s acquisition. In 1988 the first “Rice Epicurean Market” opened. It was converted from the regular “Rice Food Market” location at 5016 San Felipe. The Epicurean chain carried a more extensive and higher scale line of products. It was a bit of an oddity in the Houston market. While other gourmet stores existed they were generally much smaller, and carried only the specialty products. Rice catered to rich areas and offered very unusual and foreign products. In addition to these products they contracted with specialty companies, such as Honey Baked Ham, and See’s Candies, providing the products directly in their stores through specialty departments. This delve into new territory helped to strengthen the Epicurean side of the business, while the stores carried new products they maintained their grocery store essentials. If so desired you could stop into Rice Epicurean for a 12 pack of Coke, some truffles, and light bulbs. This flexibility helped make the chain popular with not only the upper crust of River Oaks and similar areas, but also the upper middle class “yuppies” moving into condos and apartments in the area. As time went on Rice divested themselves of all but six locations, and dumped the discount grocery chains. 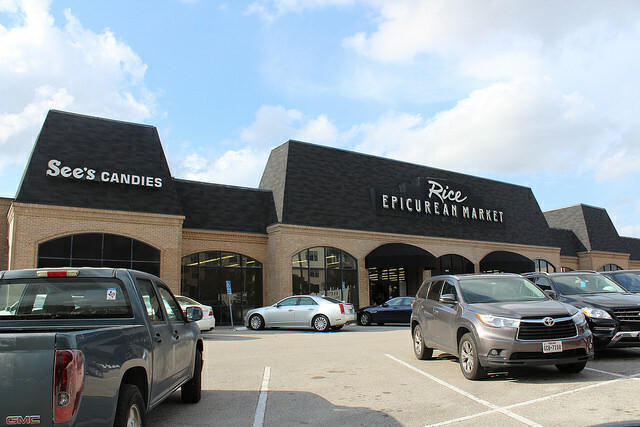 The final six locations were eventually all converted into Rice Epicurean stores. The majority of these change overs happened in the early 90’s, with one exception being the purchase of a former Lewis and Croker location. The Final operating Rice Epicurean Market location. Rice Epicurean would hang on as a six store chain for over 20 years, and the stores were known for providing excellent service. They also experimented with new ideas such as ordering groceries online and having them delivered. They even helped to pilot what would eventually become to Automate Postal Machines used by the USPS. However, their reduced size and demographics meant they needed to raise prices to stay competitive. These factors helped to push the decision to shutter all but one location. In a fate similar to what the Weingarten family had decided to do with their stores nearly 30 years earlier, Rice would exit the grocery market and delve into real estate. They made this decision through leasing their stores and other locations in shopping centers which they owned. The decision to leave the grocery market was met with the almost immediate announcement that Rice would be leasing all the former Epicurean stores to a chain known as “The Fresh Market”, an organic and health food style grocery store based out of North Carolina. The Fresh Market ditched the higher end items that Rice Epicurean carried, but did keep a few of the essentials in addition to their otherwise organic and healthy fare. The Fresh Market would vacate one store in 2012, leaving it vacant until the chain pulled out of Texas in 2016, and the other stores were closed. One location was converted into a Walgreens, while the remaining locations are being leased out to Total Wine Superstores which opened in 2017. 2020 Fountain View was AppleTree until 1994, then Rice Epicurean bought the store. It was in a package deal with several other stores.